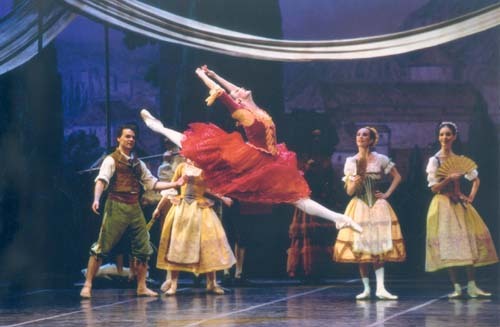 PARIS, 11 June 2004 - When Carolyn Carlson's Signes was staged at the Palais Garnier in 1997, what marked me most was the image left, not of the mediatized danseuse étoile in the main role, but that of a tall, slender girl, Marie-Agnès Gillot, the incarnation of grace and spirituality, who illuminated the third and sixth tableaux of the beautiful ballet created around seven of Olivier Debré's paintings. Like no other, she seemed to translate the inexpressible in the fleeting choreography that Carlson created around her. Seven years later, on an evening earlier this spring, a radiant Marie-Agnès, sublime in the central role this time, was nominated étoile after the performance, the ultimate accolade for a dancer in the Paris company. "I was overwhelmed to be given the title of étoile after dancing Signes", the twenty-eight year old dancer told me in an interview several days later. "It's the first time an étoile has been nominated after dancing a contemporary ballet. I think many people were surprised as modern works are generally considered less important than the classics, although they now represent half the repertoire of the company." However, there could have been no surprise as regards the nomination, because this magnificent dancer has been quietly emerging as a most gifted and versatile young ballerina for some time. Not only is she an extraordinary interpretive dancer in contemporary works, but she is also utterly beautiful in the classics. She has the authority and dramatic intelligence that makes her an obvious choice for the leading roles in almost all the full-length traditional ballets, while she is simply spectacular in both Balanchine and Robbins. Marie-Agnès Gillot was born in Caen and began dance at the age of five, when her mother took her to ballet class once a week as an outlet for her surplus energy. Fortunately, her teacher was Chantal Ruant, wife of the Paris Opéra's Francis Malovik*, who quickly saw her potential, and suggested she audition for the Paris Opéra school at the age of nine. "I adored every moment of my time there", she told me, "although I'd never been away from home before. I was so well looked after by Madame Beaumont. At first, we lived in a lovely apartment on Boulevard Haussmann, before moving to the new school in Nanterre for the last three years. Moreover, I got on wonderfully well with Claude Bessy **. The shock came when I joined the company in September 1990!" "At fourteen and a half, I had to have a special dispensation to join the company at fifteen, but then, being tall for my age, people thought I was older than I was. I remember being totally bewildered. I was a child in a world of adults, and being the youngest member of the corps de ballet was very hard." Gillot was instantly noticeable for her extraordinarily long legs, high extensions, and perfect feet, which, coupled with a brilliant technique, soon drew the attention of contemporary choreographers, beginning with Daniel Larrieu, who chose her for his new work, Attentat Poétique. Shortly after, the genuine interest shown her by Mats Ek and Carolyn Carlson catapulted her into the limelight as a superb contemporary dancer. "Carolyn Carlson marked a turning point in my career", Gillot told me. "She taught me what to do with my femininity. Up until then, people had been interested by my force and vitality, and I was repeatedly given technically difficult roles, whereas Carolyn drew out my fluidity and made me realise I was a woman, not some androgynous being. It was the first time I'd been encouraged to be myself, to show the person behind the technique, and in many ways Signes in 1997 marked the beginning of my career." "She made me realise that I had plenty to say, both in contemporary and classical works, and an unusual situation arose whereby I came to the traditional nineteenth century ballets via contemporary works. It seems incredible, but because of my experience in modern ballets, I began to interpret the classics differently. Usually, it happens the other way round. " 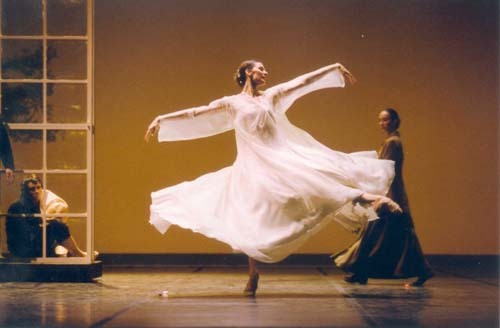 With her long dark hair, pale complexion and huge brown eyes, Marie-Agnès Gillot resembles a romantic heroine, and not unnaturally, Raymonda, Kitri, and Nikiya as well as Gamzatti in La Bayadère, began to form part of her regular roles. Last season she made her debut in Paris as Odette /Odile, and whilst her brilliant interpretation of the black swan had been expected, she also captivated with her exquisite white swan. She was a queen, vulnerable, tender and loving, with her beautiful arms and supple back. Too used to seeing her type-cast as Lescaut's mistress, many in the audience were stunned by her soft, lyrical, and gentle dancing. "I'd prepared the role a year before", she told me. "I also went to dance it in Shanghai, so it wasn't the first time. I went to Spain to work with Loipa Araujo, prima ballerina of Cuba, who is married to Plisetskaya's brother, and thus familiar with both the Cuban and Russian style and then I returned to work here with Patricia Ruanne. I like to prepare all the roles I want to dance well in advance, to understand the meaning behind each movement. I have to know exactly what I am expressing and why." Marie-Agnès Gillot has a large video collection of many of the great interpreters, including her favourite international stars Altynai Asylmuratova and Uliana Lopatkina, both of the Kirov, and her admiration also extends to Alina Cojocaru, whom she recently saw dance Giselle at the Paris Opéra. Hypercritical, she will analyse videos of her own performances, criticising the dancer she sees for the slightest wrong attitude, and will spend hours searching for the exact position of a shoulder or head which best expresses the emotion she wishes to convey. A currently exciting project is a trip to Stockholm to work exclusively with Mats Ek, the Swedish choreographer who has chosen her to interpret his Giselle, in the role created by the great Ana Laguna in 1982. The fact that Ek, who doubtless appreciated her dramatic gifts in The Apartment, has asked for her, had given her an enormous bout of confidence this last year. What Gillot is doing, however, whether she realises it or not, is changing the face of contemporary dance. Young people as well as an older generation come to the Palais Garnier specifically to see her in modern works. Edouard Lock was no dupe when he gave her the main role in André Auria, for her very presence in it attracted spectators reluctant to see the sequel to the work interpreted by his own company at the Theatre de la Ville some weeks later. Neither was Kader Belarbi when he chose her to create the central role in his Wuthering Heights. The Paris Opéra Ballet might well enjoy their reputation as one of the finest classical companies in the world; with artists of the quality of Marie-Agnès Gillot, I can think of no finer place to see contemporary works either. * Francis Malovik: dancer at the Paris Opéra under the directorship of Rudolf Nureyev, before becoming ballet master at the National Ballet of Bordeaux. Patricia Boccadoro writes on dance in Europe. She contributes to The Guardian, The Observer and Dancing Times and was dance consultant to the BBC Omnibus documentary on Rudolf Nureyev. Ms. Boccadoro is the dance editor for Culturekiosque.com.